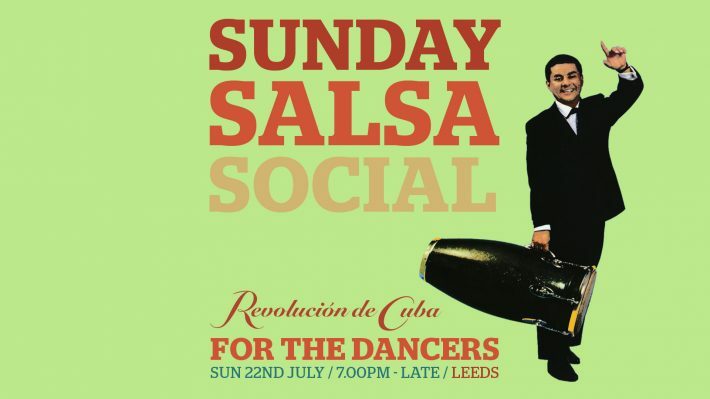 After 2.5 years of weekly “Salsa Social” parties at Revolucion De Cuba Leeds on Tuesdays, hosted by DJ Lubi Jovanovic, a new monthly “Sunday Salsa Social” is being launched at the same venue on Sunday 22nd July. Manchester has had a “Sunday Salsa Social” for over 3 years (also hosted by DJ Lubi), and now Leeds is getting it’s own version. Lubi is linking up with fellow Calle Ocho Leeds/Revolucion De Cuba Leeds “Fiesta Latina” resident DJ Fabio Bahia to launch the new night on Sunday 22nd July. It’s a nice early doors session from 7pm to 12 midnight. Sundays at Revolucion De Cuba has it’s “Havana Good Time” promotion of 2-for-1 deals on all tapas and all cocktails so come down early and fuel up on some tasty Cuban/Latino cuisine before an evening of salsa dancing. The party is an inclusive night for all salsa dancers – beginners, improvers, intermediates, advance dancers – and for all styles of salsa dancers – cross body, Cuban, Colombian, freestyle. Music policy is great salsa past and present including Puerto Rican salsa, New York salsa, Colombian salsa, Cuban salsa plus some mambo, son Cubano, cha cha cha and bachata. No reggaeton/Latin party tunes – this party is for the salsa dancers. It will take place UPSTAIRS in the club NOT down in the bar. Yes salsa dancers, once a month you’ll get the chance to dance on that beautiful wooden floor up in the club to a fantastic sound system. Don’t miss this opportunity. Doors 7.00pm. Door entry price is just £3. The night is self-financing via door spend to maintain the 100% salsa music policy. Salseros, mark the date in your diaries and see you on the dancefloor on Sunday 22nd July.